More than 3,000 volunteers turned out for Coastal Cleanup on the Palisadoes Strip in East Kingston on Saturday. 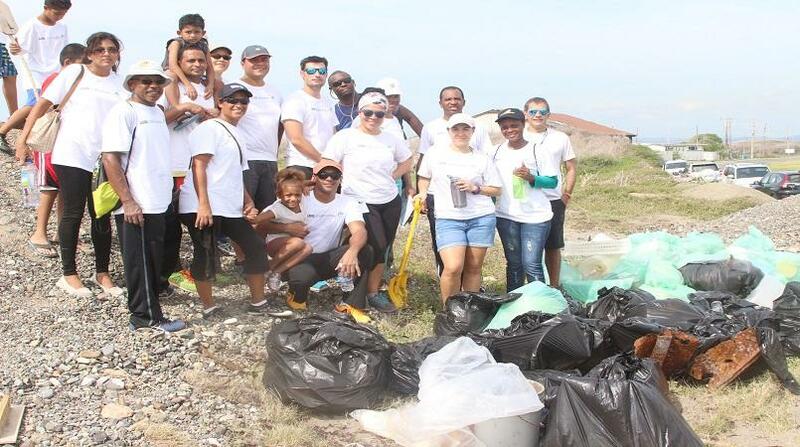 In the 31st year of the International Coastal Cleanup Day, the Jamaica Environmental Trust (JET) was pleased with the growing number of Jamaicans who have shown interest ad enthusiasm in the initiative geared at cleaning up Jamaica’s coastline. This year some 144 beaches and other registered sites have been targeted cross the island. There will also be clean up of rivers which eventually flow into the sea. “We are very pleased with the turnout. Already we have registered more than 3,000 volunteers. We aim to make the top 10 countries this year. We have had volunteers from Corporate Jamaica, schools, universities, churches, civic groups and communities,” JET Chief Executive Officer, Diana McCualay told Loop News. Senior Manager at Ocean Conservancy – the organisation which coordinates coastal clean ups around the world – Allison Schutes, was in the island for this year’s event. “Jamaica is so unique. It’s a relatively small country but the amount of volunteers and the amazing events that take place for Coastal Cleanup, is just amazing. So I as excited to come down and see, 3,000 people in one place? There are not many countries where that happens for costal clean up,” Schutes said. Some 100 countries have staged coastal clean-ups this year. The volunteers walked the beach and the opposite Kingston Harbour and collected every imaginable kind of refuse that was strewn about for miles. The most common type of garbage was plastic bottles. There were also glass bottles, old refrigerators, stoves and other appliances, disposable diapers and other forms of garbage collected. The volunteers were required to log every single item collected and their findings will be tallied by JET who will release the overall amount of garbage collected this year. The Coastal Cleanup is funded primarily by the Tourism Enhancement Fund and is being held under the theme Nuh Dutty Up Jamaica. This is the 23rd year the cleanup is being held in Jamaica.